In most parts of the US, home solar power systems are probably the most effective, most convenient, and most flexible way to generate ‘green’ energy in a home environment. Yes, for those living in Northern states, looking out on dark winter days, and disappointing summers, you could be forgiven for thinking that here in our neck of the woods, solar energy is a hiding to nothing, that there simply isn’t enough of it to be useful. The fact is though, that the sun floods all parts of our planet, except the polar regions, with abundant energy, throughout at least half the day, and throughout most of the year. Just consider for a moment, a south facing roof of an average-sized house (in the US). This will usually be large enough to accommodate sufficient solar panels to generate 4kW of electricity, on a bright sunny day. Which means that, when the sunlight is half as effective, you’re still getting 2kW – not bad! The most common way of harnessing the sun’s energy – indeed the most common form of ‘green’ energy generation – in a domestic environment, is exactly this, photovoltaic, i.e electricity-generating solar panels installed on the roof, feeding their output into the mains, and from there (often) to the national grid. The owners of these systems get two benefits, (1) they get as much of the electricity generated as they can use, (2) they get a significant payment from the government (in the form of tax credits and rebates – such incentives can significantly lower the net cost of installing a solar power system in your home). Outside of the US, government schemes such as the F.I.T., which exists in Japan and the UK, are also intended to compensate for the main disadvantage of home solar power. This is that, the energy is MOST available, on hot sunny days, when it is LEAST required. Surplus energy from validated systems is fed back into the national grid. The owners of the panels may not be able to use the energy, but someone else probably can, and the F.I.T is paid, partly, in recognition of this. So Is it cost effective? 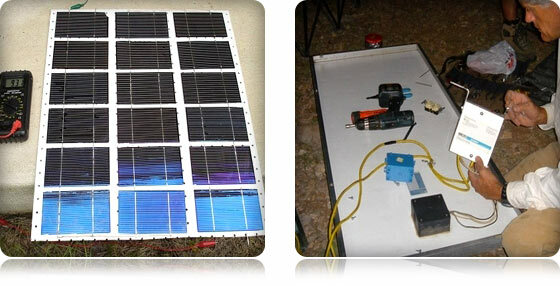 HOWEVER, there are ways around this, if you are not afraid of a little D.I.Y., it is in fact quite possible to make your own solar panels (using pre-constructed power cells) and thus build a solar electricity generating system of your own (read our Green DIY Energy Review for more on this). Heating air (i.e. space heating) and heating water are two, comparatively ‘low-tech’ ways to use solar power in a domestic setting. Systems of this sort have traditionally been home-made, requiring no more than quite basic plumbing skills to set up (although they do require significant engineering knowledge to design, hence the need for manuals and guides). Also, both systems offer solutions to the basic problem of storing solar energy so that it is available when you need it. Storing solar energy which has been converted to electricity is relatively complex and expensive, but storing solar energy as hot water, for instance, is simplicity itself, you simply need an adequately insulated hot-water tank. How Do These Methods Work? A solar water heating system consists of panels of some kind, through which water travels and heats up on its way to a heat exchange assembly in the hot-water tank. A solar space-heating system (or air heating system), consists of solar windows (which can take up a whole wall, and hence be called a ‘solar wall’). The air in the space between the double panes in these windows heats up and is released into the room when required (most often at night). This sounds just too simple, but is in fact one of the most effective and widespread solar heating arrangements currently in use. Want to learn more? Browse our green energy section for tips and products that will help you lead a greener lifestyle today.